Beale Street, for the first quarter of this century, was one of the roughest and toughest, most rocking and swinging, wide-open streets in the country. It was a close counterpart of Kansas City’s Eighteenth and Vine. Memphis was the next major port up the Mississippi River from New Orleans, and Beale Street started right on the docks where the big steamboats unloaded their cargoes of cotton, corn, cows, and chickens. Down by the river, Beale was lined with chitlin’ joints, saloons, brothels, cigar stores, and pool halls. Moonshine whiskey was sold on every corner, and cocaine sold for a dime a box at Lehman’s Drug Store. From out of this mix came a blues, rich and mature, the likes of which had not been heard before. To Walter Lewis, Beale Street was home. His family had moved there from Greenwood, Mississippi. In 1899, when Walter was six years old and about the time he picked up the nickname “Furry.” Furry never went to school much; he got his schooling on Beale Street. He learned his first chords on a homemade, put-together guitar and was soon sitting in with some of the older street musicians. One musician that Furry idolized was Jim Jackson, a minstrel performer from Hernando, Mississippi. When Jackson went to join Dr. Benson’s Medicine Show, Furry left home to follow him. Even though he was only twelve or thirteen years old at the time, he stayed on the medicine show circuit for the next two years. By the time Furry got back to Memphis, W.C. Handy had come to town and was heading one of the most popular bands in the city. Although he was never a regular member of Handy’s orchestra, Furry often played with them. He was always proud of his association with Handy and, in later years, often boasted with great pride that the famous orchestra leader gave him his first good guitar. About the time Handy moved to New York, Furry hit the road, again hoboing around the South, working tent shows, jook joints, and street corners. His versatility as an entertainer made him a favorite with tent show audiences. He was as much a comedian as musician and could crack a joke, tell absurd stories, dance a little soft shoe, or perform an unabashed black face routine. In 1916 while trying to hop a freight train somewhere in Illinois, Furry fell under the wheels and lost a leg. The accident slowed him down for a while and he had to return to Memphis. 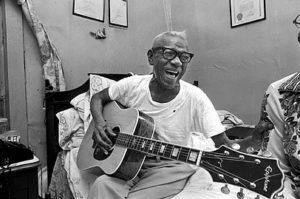 He became one of the regular Beale street characters, frequently playing with Gus Cannon, Will Shad, and Jim Jackson. Even though Furry was popular and in demand in the clubs, the pay was low and unsteady. In 1923 he began working for the city as a street cleaner, a job he held for forty-five years. Ion 1927 Furry made his first recordings for Vocalion Records of Chicago, and during the next two years, he recorded more than twenty sides for the Vocalion and Victor labels. Most of these were Memphis blues standards, but a few songs like “John Henry’ and “Stack-O-Lee” are especially notable in that they are in the older pre-blues style of the African –American songster. After his final session with Vocalion in 1929 Furry did not record again for thirty years. The early recordings show that Furry was an able guitarist and expressive singer. He used the Delta bottleneck slide technique, but influences of medicine show banjo picking and sophisticated jazz stylings could also be heard in Furry’s guitar. His voice was high pitched, with a limited range, but he was able to express a quiet subtlety in his singing that was uncommon among blues singers. With the stock market crash of 1929, Beale Street started to decline and so did Furry’s career. He finally stopped performing except as a pastime until, like many of the old blues musicians, he was rediscovered by the folk and blues revival crowd in the 1960’s.